I didn't plan it this way, but reading this book kinda' fits into my recent mini-007 meme. Oh, wait a minute. The name is Dunn. John Dunn. Not Bond-James Bond. His operative ID and the name of Her Majesty's Secret Service are altered, as well. And Gimbel's not the only guy suffering this fantasy/reality swap. But that's just one element in Isenberg's delightfully absurd satire. O'Hare works for Byte Yourself, a software company which has jumped from an entrepreneurial start-up into an empire--much to the chagrin of competitors and bureaucrats. Those competitors and bureaucrats have joined forces to bring down Byte Yourself, and Gimbel O'Hare is caught in the middle of it. Full Asylum weaves together British superspy mania, professional wrestling, paintball and a charming cast of characters in a tale of office politics gone viral. Or should I say, gone pandemic? "...It isn't easy when everyone responsible for enforcing the law works for the criminal." If you're in the mood for some social satire with a lighthearted touch and a positive attitude, give this one a read. Looks like I've got a little 007 theme going lately. I've been going through Ian Fleming's books, and re-watching the Bond movies. After seeing Casino Royale a while back, it seemed like the film franchise was reconnecting with the roots. I also saw Quantum of Solace, and remember very little of it. If I had to describe it in one word, I'd say, "forgettable." But I'm usually willing to give someone another chance after falling flat, so I gave Skyfall a look. I'll remember this one, so it's at least an improvement over the last Bond effort. But it's hard for me to classify it as a Bond movie. Seems to me the film makers weren't trying to make a Bond movie--they were trying to make a typical blockbuster action flick: a formulaic Explosion Fest punctuated by chase scenes. In that they were successful. They also threw in a villain who is, basically, Hannibal Lecter without the cannibalism. And they tied it up nicely in the end to make it a reboot of the 007 mythos, with a new M, a new Q and a new Moneypenny. There was a cameo by the 007 spy car from the Connery-era movies, too. The Aston Martin was never a very attractive vehicle in my opinion, so what happened wasn't as annoying as it was designed to be. But from the moment it appeared on screen I knew (modern action flick directors having a fetish for vehicular destruction) the sucker was toast. What goes through their minds, anyway? Do they fear that moviegoers will demand their money back if there's one less cinematic fiery blast in their cookie cutter plots? Or are they just too caught up in some kind of sick pyro-sexual thrill to think at all? Skyfall is a crowd-pleaser, but could have just as easily been a Die Hard, Bourne, Taken or fill-in-the-blank series movie. Watch the videos--they sum up a lot of my thoughts on this movie. I used to be a sucker for these movies. From Louis Gossett Jr. playing Satchel Paige to The Express: the Ernie Davis Story not too long ago, I ate this stuff up. But my enthusiasm has waned in recent years. One reason this movie has a strike against it (pun intended) from the opening pitch is because the story has been told so many times already. It's difficult enough scraping up some originality for ANY jock flick, much less the Black History subgenre of jock flicks. Most people still love to watch a silver screen depiction of an athlete overcoming adversity, beating the odds and earning some kind of great victory. Not easy to do without becoming predictable. Throw in the "color barrier" aspect from the Jim Crow days and not only is the outcome predictable, so is most of the conflict on the way to it. We know the hero is going to be persecuted by rednecks in the bleachers, on the opposing teams and in their own locker room. Bigots will deny them hotel rooms, seats on planes and buses, and rob them of good plays on the field with blatantly crooked officiating. There will be a gratifying scene or two of those bigots getting some measure of commuppance; a touching instance of a teammate overcoming his own bigotry to help the hero at a critical juncture; and of course the big Victorious Moment when the hero scores the big home run/touchdown/goal/knockout/three-pointer/whatever. I don't know that much about baseball and have never followed it (though I played in Little League and plenty of sand lot games as a kid), but according to some quick Internet research, 42 is surprisingly factual (if chronologically tweaked). 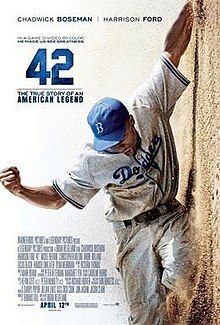 And yet while watching it, I couldn't help feeling that it wasn't about Jackie Robinson the man--Jackie Robinson's name was merely stuffed into the Hollywood Black History Jock Flick cookie cutter. The film makers combined visuals, dialog and mood music at all the Big Moments for the desired effect, but to me this was just faithful adherence to a well-worn formula. 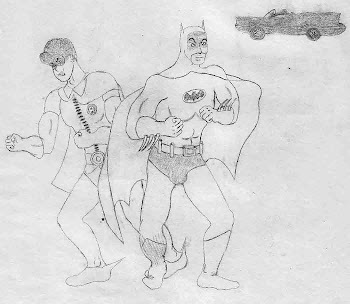 It's hard to tell if there was much, or any, passion for the subject matter. This lack of passion trickled down into the performance of most of the actors. The best I can score most of them is "near miss." I can't fault the players, who certainly seem talented enough. In the case of Robinson's wife, reporter Wendell Smith and both managers of the Brooklyn Dodgers, they just didn't have much to work with. They were given just enough screen time and dialog to mark off a box on the formula checklist, but not enough to contribute anything significant to the story. Nicole Beharie as Rachel Robinson, for instance, could have been instrumental in helping her husband temper the rage building in him from the injustice he suffered. It almost seemed like that's what we were about to see once or twice. But if the scenes were ever shot, they must have wound up on the cutting room floor. So the passionate embraces and expressions of concern which were included amounted to nothing more than boxes checked off. Successful stamps of the cookie cutter. 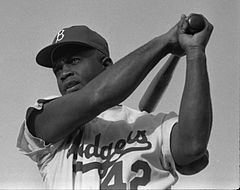 Even the lead actor Chadwick Boseman wasn't given sufficient opportunity to define the Jackie Robinson character beyond type. Harrison Ford, however, hogged the camera from beginning to end, mugging and hamming as owner Branch Rickey. So much so that the flick was more about him than about Robinson. There's no doubt in my mind that Ford used his clout as a big name movie star to amp-up his part, to the detriment of the film itself and the other actors in it. And critics may even praise him for "stealing the show." 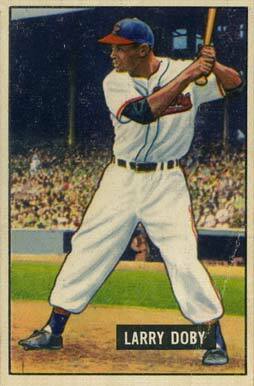 Robinson (as well as American League counterpart Larry Doby, and trailblazers Satchel Paige and Josh Gibson) were exceptional athletes and remarkable men. Unfortunately, there's nothing exceptional or remarkable about this movie. In addition to the formula being so overused, maybe Hollywood film makers are equally hindered, subconsciously by their own worldview, from crafting a noteworthy film on this topic. After all, to tell the story with any modicum of historical reality they must depict an individual who, through hard work, diligence, determination and a measure of God-given talent, fights his way up from obscurity, rejects mediocrity, pursues excellence and achieves it despite the many forms of adversity in his path--usually an offshoot of institutionalized group identity. And the individual's exceptional accomplishments did not come by way of entitlement programs or government handouts. That's not a message Hollywood likes to deliver. Thanks to Books on Tape, Blackstone Audio, et al, and now Audible Audio for my Kindle, I'm tearing through books at a steady rate during work-related travel. After paying for my subscription to Audible Audio, I decided it was finally time to read the source material for the spy movies I grew up with. I had previously read Casino Royale and You Only Live Twice which were fairly good reads, but were quite a different flavor from the Bond flicks I'd seen. So anyway, I set out to go through the rest of the Bond canon in the order the novels were written. So far, in addition to the two mentioned above, I've read Live and Let Die, Moonraker and From Russia With Love. The first Bond I ever saw on screen was Roger Moore. It wasn't until my teen years I began to see some of the Sean Connery flicks. I knew nothing about the literary Bond, and didn't favor one actor over the other, but I liked the Connery flicks better. My favorite became Thunderball. How can you go wrong with an underground battle between frogmen using spearguns and submerged jet skis? My senior year in high school I got a chance to see Dr. No and I really liked it. Not many cool gadgets, but the feel of it was groovy, and Connery's Bond in this flick was one cool customer (closer to Ian Fleming's character, in my opinion, than any actor has come until Daniel Craig or perhaps Timothy Dalton). Speaking of Timothy Dalton, I just saw License to Kill this month. Hollywood finally did to Felix Leiter what Fleming did to him in the second Bond novel. I was shocked to read about the fate of Bond's CIA counterpart in Live and Let Die, not just because it was gruesome, but because Felix Leiter had been a healthy, able-bodied staple in just about every Bond movie. I'm sure this topic has been analyzed to death, so I won't ramble on too long. But reading the books does take some of the Bond mystique away. The silver screen Bond is a supercharged exaggeration of the character in nearly every way, as are his adventures. The literary Bond has only used his "license to kill" a couple times in his career. The movie Bond kills anywhere from three to a dozen times in any given story. One of those kills to Bond's credit, by the way, occurred during the war if I remember correctly. What war? Fleming's Bond got into intelligence work during WWII, and continued serving in that capacity into the Cold War. In the movies, he was strictly Cold War, and we were never given any indication how he got into the business. He was conceived in a test tube by M for all we knew. With all the reboots, I think even the Cold War origin will soon be swept back (if it hasn't already). And with the Daniel Craig films delving more into the Bond character than any previous flicks, we'll probably get his background filled in, too (retrofitted, of course). Hmm. Just checking the canon, I realized I skipped Diamonds Are Forever. Have to remedy that. I was actually checking because From Russia With Love ended in an almost cliffhanger fashion and I wanted to see what followed it, guessing it would be You Only Live Twice. Nope. Dr. No. Well, my Bond education will continue. Though the books are interesting, I don't like them enough to make them a priority. So this could take a while. I am new to Zombiemania and, truthfully, still an outsider. But my education has begun. My textbooks? The first two seasons of The Walking Dead, and this book. Well, I also saw Night of the Comet back at York Theater many moons ago, as well as I Am Legend much more recently. Okay, technically IAL was about vampires, but they behaved enough like zombies for the movie to fit in the genre. I've also watched a variety of post-apocalyptic flicks wherein mutants behave pretty much like zombies, too. Seeing as how zombies originated in Voodoo, one could argue that even the zombies in "purist" zombie film/fiction aren't exactly zombies, either. Back to the book: (I listened to an advertised "unabridged" audible audio version via my kindle/car stereo.) Bourne has written it in journal fashion, from the perspective of a Navy aviator living in San Antonio. It has a familiar TEOTWAWKI feel to it--the hero survives the initial catastrophe only to face the struggle for survival in a new, far more dangerous world. Enemies are everywhere--mostly undead--but he collects friends along the way. Then the book ends without taking us anywhere. Afraid that I must have bought a glitched version with the last 2/3rds missing, I checked good ol' Amazon. My investigation turned up evidence that this book began as free zombie fan fiction on a blog. And now it makes perfect sense why there is no story arc or character development, and why it ended just when it had potential to get really interesting. Basically I paid money for some blogger's writing experiment.